DHAKA, Feb 15 2012 (IPS) - “Welcome to Krishi (farming) Radio. You are listening to FM 98.8 megahertz and I am your hostess Shahnaz Parvin,” the local community radio crackles over the mobile phones and transistors of residents in coastal Barguna district. Parvin introduces her guest of the evening, Amal Chandra Sarker, 40, a farmer who has a story to tell about how he reaped a good harvest from growing a new variety of saline-resistant pulse, developed by Bangladeshi scientists. During a 10-minute discussion Sarker tells avid listeners, most of them farmers, how he coaxed the ‘mugh’ harvest from soil that lay abandoned for years because of saline ingress. “I learnt from the agriculture information service that ‘BARI-6’, a newly developed mugh variety, had excellent saline resistance and so I took a chance,” Amal said, as phone-in discussions continued. The daily, two-hour evening programme is designed to address the many problems that farmers commonly face in these parts, particularly tidal flooding and salt ingress that have forced thousands to abandon traditionally arable lands. Since November 2011, when Krishi Radio began broadcasting expert advice, hope has been building up that a good portion of abandoned land in six coastal districts can be recovered for farming. Krishi Radio anchors regularly discuss best practices and encourage farmers to stay put on their lands in the face of climate change impacts that are already being felt. The United Nations Inter-governmental Panel on Climate Change predicts that 17 percent of deltaic Bangladesh would be submerged by seawater by 2050 and several million people forced to migrate away from the coastal zone. Some 75 percent of Bangladesh’s 145 million people depend on agriculture for a living, making authorities sensitive to events or situations that disrupt farming. “We advice farmers on how best to use their land in the face of increasing salinity that is causing huge economic losses in the coastal region,” said Zakia Sultana Baby, an agriculture officer who also pays regular field visits to farmers. “Such visits and demonstrations can now be reduced as we explain every aspect of cultivating a new crop during our live discussions over radio,” she told IPS. “Agriculture is the worst affected by this silent killer (climate change) and so we thought relaying special programmes to farmers would be an excellent idea,” says Mohammad Sharif Iqbal, station manager of Krishi Radio. The local agriculture department started out by organising a series of awareness programmes, distributing leaflets, posters and public announcements to inform the largely fishing and farming community about the new radio service. More than 100 local farmers in the district belong to a club that regularly tunes in to Krishi Radio and participates in live discussions. “It was a challenge initially, but soon the response picked up and inquiries started streaming in about our programmes,” said Jahangir Alam, project director of the radio station, located some 340 km from the capital Dhaka. In fact, the programmes have become so popular that from next month onwards the station, now manned by a team of ten people, plans to be on air for an extra four hours divided over the early morning and mid-afternoon. “Although it is called Krishi Radio, and meant primarily for farmers, there are programmes that address social issues like health, family planning, fishing, education, adolescent needs, human rights, nutrition and legal matters,” Sharif said. Krishi Radio also has plans to serve the fishing community that operates out of the Kua Kata harbour about 25 km away. “This is one area that we want to concentrate on. When the sea suddenly turns rough the fishers’ lives are in danger. Keeping this in mind we regularly transmit special weather bulletins advising fishers to follow safety precautions,” said Atiar Ferdous, 24, a volunteer. Financed by the Food and Agriculture Organisation, the radio station was set up on land donated by the local council of Amtali village and at a cost of about 300,000 dollars. “The community radio’s growing popularity is owing to the fact that it really serves the needs of the rural poor people,” Salauddin Ahmed, union council chairman of Amtali village, told IPS. 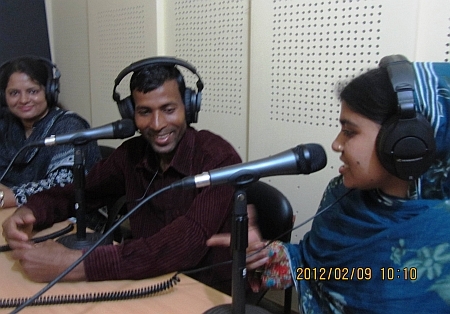 A total of 14 such community radios are now on the air in Bangladesh, each focused on local needs and grouped under an umbrella called, Bangladesh NGOs Network for Radio and Communication.